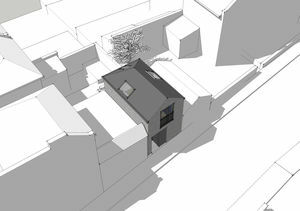 A contemporary 'bijou' house on a small vacant site within the Cotham, Redland and Gloucester Road Conservation Area in Bristol. With a gross internal floor area of 38 square metres, this one-bedroom property is quite possibly the smallest house in Bristol. 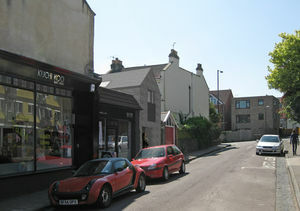 The site, a redundant service yard, is located on Chandos Road, a bustling street of shops, cafes and bars in a Victorian neighbourhood. 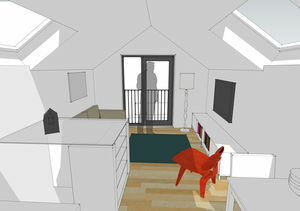 The scheme is conceived as a simple, crisp building 'slotted' into the gap, and addresses the constraints imposed by the site by placing the bedroom and bathroom on the ground floor either side of a central stairwell, with living spaces occupying an open-plan space on the first floor. This arrangement allows the living areas to take advantage of the only outlook available from the site, towards the street, whilst allowing an element of privacy at this higher level. It also allows natural light to flood down through the stairwell and means that the eaves can be lowered at the edges of the room, thus reducing the scale of the building and its impact on surrounding properties and small private gardens. Brick is used for its robust and tactile qualities, as well as the pragmatic necessity to construct over-hand when tight up to boundaries.